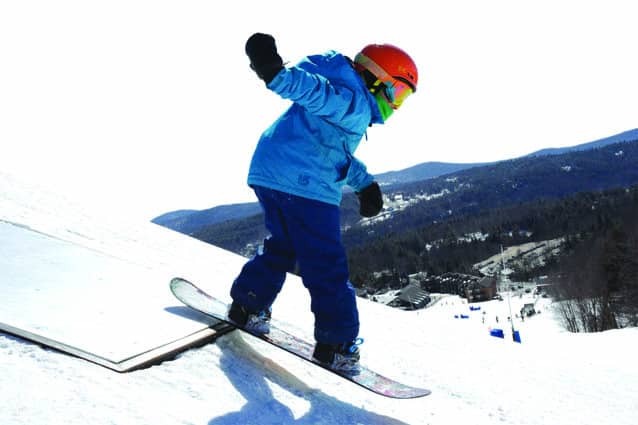 Saturday, Jan. 7 at 12:30 p.m.—LUDLOW—”Grommet” is a widely accepted term for a young person who participates in extreme sports such as surfing, skateboarding, skiing or snowboarding. At Okemo’s Grommet Throwdown, Jan. 7, kids age 13 and younger can spend the morning with Okemo park rangers and Ski + Ride School instructors learning park etiquette, safety and some tips for performing tricks on terrain park elements. In the afternoon, Okemo’s Bull Run will become a festive competition site as participants demonstrate what they learned earlier in the day. Prizes will be awarded for the best tricks. Admission to this event is free and participants will gather on Okemo’s Bull Run trail, located in the Clocktower base area. Registration for the afternoon competition starts at 12:30 p.m. at the bottom of Bull Run, and the contest will begin at 1 p.m.
A young snowboarder comes of the edge of a feature in the Hot Dog Hill terrain park at Okemo Mountain Resort.